Srila Prabhupada: Every one of us is searching after some mellow, some pleasure from everything. Krishna is the reservoir of all pleasures, rasa-vigraha, fully personified. Wherever there is Krishna, there is rasa, a transcendental mellow, enjoyment, relishable. Surat, December 17, 1970. Ambarisa Das: Srila Prabhupada was a true visionary. He always had very big ideas for the spreading of Krishna consciousness and the ideal Vedic culture. Now here in India we are constructing a very large Vedic Planetarium…within the planetarium we will construct a huge, detailed model of the universe as described in the text of the fifth canto of Srimad Bhagavatam. Within the planetarium the model will be studied by onlookers from different levels by use of escalators. Detailed information will be given on open verandahs at the different levels by means of dioramas, charts, films etc. As in everything he did, Srila Prabhupada was acting in fulfillment of the desires of the previous Acharyas, or spiritual preceptors. 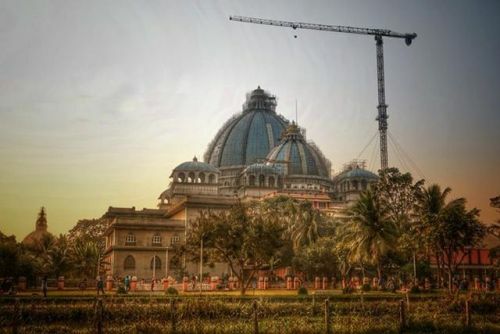 A grand temple for Mayapur was predicted by none other than Lord Nityananda, the most intimate associate of Sri Caitanya Mahaprabhu, some five hundred years ago. When our Lord Caitanya disappears, by His desire, the Ganges will swell. The Ganges water will almost cover Mayapur for a hundred years, and then the water will again recede. For some time only the place will remain, devoid of houses. Then again, by the Lord’s desire, this place will again be manifest, and the devotees will build temples of the Lord. One exceedingly wonderful temple (adbhuta-mandira) will appear from which Gauranga’s eternal service will be preached everywhere. Love, Learn, Pray, Give, Accept, Release, Let Go, & Celebrate! Karnamrita Das: I often think about how to express the most important aspects of life that can most benefit us all. The following is one perspective and attempt to do this. We begin by sensing that love is our nature and that which we most hanker for. When we discover that our capacity to love in this world, and the capacity for others to accept the amount of love we are capable of giving, is limited and ultimately unsatisfying, we can begin our quest to realize our spiritual nature as beings of eternity, wisdom, and love. We discover that the fulfillment we seek is only possible when our spiritual nature is gradually awakened since this nature is who we truly are. There are many stages of this divine awakening which will be promoted by those who seek the goal their path offers. According to the bhakti Vedic scriptures, the highest stage is when our loving propensity and full consciousness is reposed on the Supreme Original Person, God, or Krishna. When we love Krishna, then we always know what to do. This is true learning and practical wisdom. Krishna teaches in chapter 15 of his Bhagavad Gita, that when we know Krishna as the Supreme Original Person, without doubting, then we know everything that is necessary. 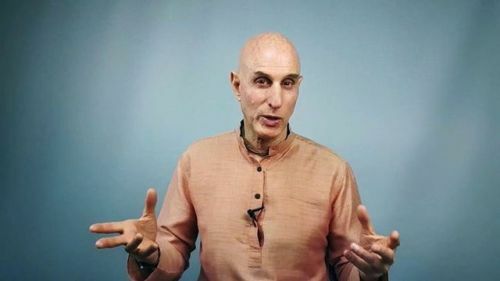 In our endeavor to learn to love Krishna (bhakti), we learn that prayer—through chanting the holy name, reciting prayers in the scripture and by great devotees, and our personal prayers—is our connection to God and leads us to serve and remember him. We also learn that by serving, loving, and giving to others in the spirit of service to Krishna, we grow spiritually and help others as well (para-upakara). 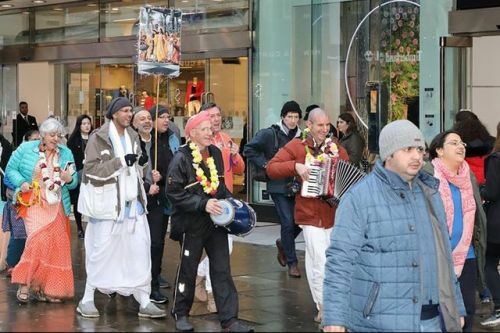 We can’t separate Krishna from his devotees, and that spiritual essence is in everyone. If we are only interested in serving and acknowledging God, without being kind and serving his devotees—which includes all living beings—we are considered still beginners on the path of bhakti. We will be fulfilled to the extent that we can unselfishly give, on all levels, but especially when we give what the soul is truly hankering for beyond the desires of the flesh, to find our everlasting love and activity. Krishna says in his Gita’s 18th chapter that those who teach his Word from the Gita are the dearest to him, because then, we are an extension of his compassion and mercy to help others spiritually awaken. As we live through life’s many challenges, we are required to accept many conditions and situations we may not like. Part of our spiritual maturity is to accept ourselves as we are now with faith in the person we can become, as well to accept the life we have created, and our apparent fortune or misfortune. When we have faith that whatever comes to us, whether joy or calamity, is ultimately meant for our highest good to help us take shelter of God, then our acceptance is natural—as it’s a by-product of our faith that Krishna’s protection and maintenance sustain us. Krishna promises in the Gita’s 9th chapter that his devotees never perish, but are led to everlasting spiritual life. Our spiritual “job” is to excavate the connection of everything to Krishna. We must go beyond our body, our circumstances, or worldly tribulations, and find our true rest in our soul’s relationship to Krishna and the love he has for us. Our love for him expressed through service and in his glorification becomes our life connection to our Source, now, and forever. Giving to, and loving, the Center benefits everyone and everything. In this mood we can release and let go of whatever is unfavorable—attitudes, perceptions, and conditions—to this devotional giving. We celebrate this in gratitude thru song and dance, the overflow which we share with others. The Ultimate Sacrifice of Love. In the Sri Caitanya Caritamrta, it is described how Sri Caitanya Mahaprabhu along with His associates in the Panca-tattva broke open the sealed storehouse of love of Godhead, and became so intoxicated by it, that they simply couldn’t keep it to themselves, and decided to freely distribute it. Sri Nitai opened the marketplace of the holy name, allowing anyone and everyone to purchase the holy names for the price of faith. 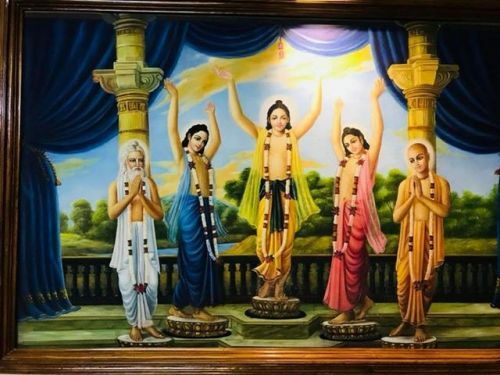 Sri Nityananda Prabhu is understood be the most merciful – even more than Patita-pavana Sri Caitanya Mahaprabhu Himself! Sri Nitai risked His life trying to save the most wretched of people, and saved the offender Kazi from the wrath of Sriman Mahaprabhu, such was His mercy and compassion. 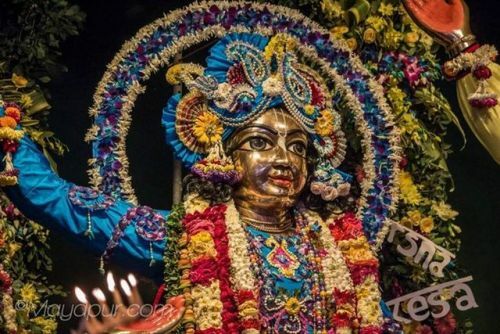 Lord Nityananda is the embodiment of service in separation – the ultimate sacrifice of love. He only met Mahaprabhu after 32 long years in separation. He stayed by Lord Gauranga’s side until He was instructed by Mahaprabhu in Puri to go back to Bengal to get married so that he could preach to the householders. This broke Nitai’s heart. Lord Gauranga was His very life; how could He possibly live without Him? However, Nityananda took that instruction to heart and went back to Navadvipa, got married and preached. No one can even begin to imagine the burning pain of separation the Nityananda Prabhu felt, but it was His sacrifice of love. His sacrifice of not having the Lord’s physical association was for the benefit of all the struggling conditioned souls, and ultimately for the pleasure of the Supreme Lord. He followed the Lord’s instructions without complaint, all the while enduring the burning pangs of separation. The acaryas say that no one can get the mercy of Lord Gauranga without the mercy of Lord Nityananda. Sri Nitai is Adi-guru (original Guru), and only by the mercy of the Guru can one make progress on their spiritual path. With determination and faith in Guru, who is the representative of Sri Nityananda Prabhu, we must push on with our sadhana and service. Every endeavour for the pleasure of the Lord is a sacrifice that one has to make in order to execute his or her duty. Srila Locana Das Thakura, in Caitanya Magala, writes a beautiful song which describes the magnanimity of Sri Nityananda Prabhu. 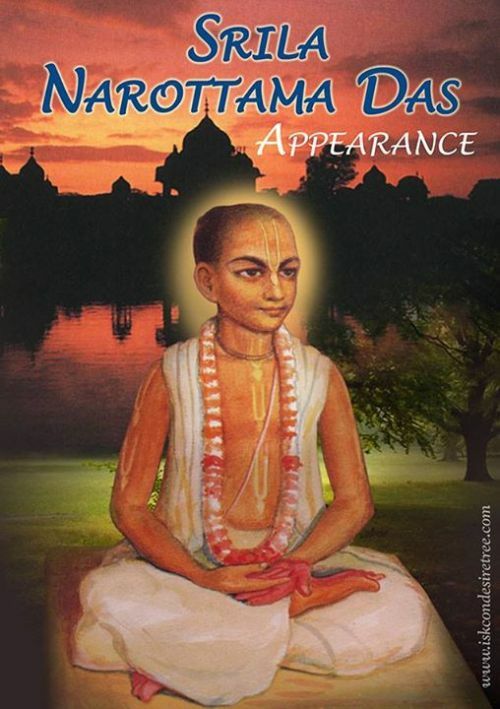 “The noble Lord Nityananda is never angry, for He is the personification of supreme transcendental bliss. Devoid of any concept of false ego, Nitai wanders about the town. “Going from door to door in the residences of the most fallen and wretched souls, He freely distributes the gift of the Hari-nama mahamantra. “Saying thus, Nityananda Prabhu rolls about on the ground, appearing like a golden mountain tumbling in the dust.